A study of DDR and SSR in Nepal | United We Blog! Preliminary sociological observation of Disarmament Demobilization and Reintegration (DDR) and Security Sector Reform (SSR) in Nepal. 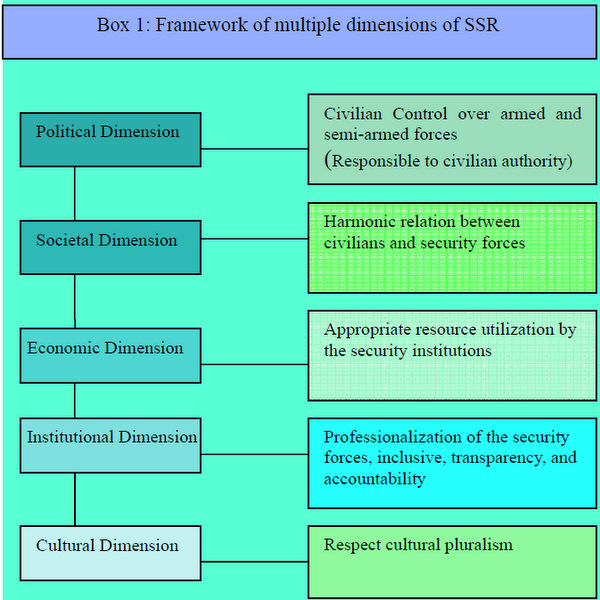 Security Sector Reform (SSR) is a continuous process to all countries and regions, including politically stable states, fragile states, and post-conflict countries. However, it is widely understood that there need to be urgent SSR priorities in countries emerging from large-scale violent conflict. Over the years, Nepalese society has undergone deep structural shift – a full decade of violent political upheaval abolished the 240 year Shah Dynasty and established a federal republic. Right now, Nepal is poised at a decisive crossroads in its transition from armed conflict to post-conflict recovery and democratic government2. Before the decade-long Maoists armed conflict, Nepal had not tolerated such an intense domestic violent crisis since the formation of the modern state. Nepal has long suffered from highly politicized security institutions. Politically, the state apparatus has been dominated by a few feudal elites who have been principally resistant to democratic reform. Particularly, the security sector has been much more complicated by nature of the long feudal-based autocratic political system. In the long political history of Nepal, the military force was commanded by the dynastic monarchy or the hereditary Rana oligarchy. There has never been any precedent for aintaining civilian supremacy over the armed force.3 Highly use and misuse of national security agencies (army, police, and intelligence) by certain political parties for their specific ends creates further problems in the security sector. On the other side, it seems a more challenging situation in the security sector may occur in the coming days due to intense proliferation of hundreds of armed militant groups throughout the nation. The Maoists armies’ (re)integration into Nepal Army to form national army is again a major challenge to the nation. The demobilization and disarmament (DD) of the Maoists army4 under UNMIN supervision has already been completed. According to the agreement on Monitoring of the Management of Arms and Armies between the Nepal government and the Maoists on December 8, 2006, UNMIN has verified 19,602 Maoist combatants. These combatants ave been living in seven main and 21-satellite cantonments (see table) under the UNMIN’s supervision, after the completion of registration. Under Resolution 1740 (2007) UNMIN has been given the mandate to monitor the management of arms and armed personnel of the Nepal Army and the Maoist army, in line with the provisions of the Compressive Peace Agreement (CPA) and assist the parties through a Joint Monitoring Coordination Committee (JMCC) in implementing their agreement on the management of arms and armed personnel.The beginning of the Maoists armed movement triggered many other social, economic, and cultural crises in Nepal. Due to the escalation of the armed movement in rural areas, creating insecurity, thousands of Internal Displaced Peoples (IDPs) were created. Hundreds and thousand of young people have left the country looking for work. Similarly, the number of IDPs increased in urban centers in Nepal due to insecurity across the country. Extra-judicial killings, arbitrary arrest, detention and abductions, extortions, torture and other inhumane degrading treatment along with the creation of IDPs are the greatest threats to security in present Nepal. To ensure the realization of security, to all victims’ families in particular, is the principal challenge of the security sector. It is necessary to introduce what SSR is and how it is relevant in Nepal and other post conflict countries. SSR is a highly political phenomenon, and experience shows that it is long process. The security sector is not confined to the core security institutions6 rather it covers broad areas that include four primary domains: first it is concerned about core security actors such as armed forces, police service, gendarmeries, paramilitary forces, presidential guards, intelligence and security services (both military and civilian), coast guards, border guards, and customs authorities etc. Second, it takes on management and oversight bodies like national security advisory bodies, ministries of defense, internal affairs, foreign, security budget and audit etc. The third sector is associated with justice and rule of law; covering judiciary and justice ministries, prisons, criminal investigation and prosecution services, human rights commission and ombudsmen, and customary or traditional justice systems. The fourth deals with on-statutory security forces: liberation armies, guerrilla armies, private security companies, and political party militias. It can be said that SSR has a multiple dimensions i.e. political, societal, economic, institutional and cultural levels (see conceptual framework of SSR). SSR is thus a prime part of the peace building process in the post conflict period and it helps create a secure environment conducive to other political, economic, and social development through the reduction of armed violence and crimes that ensures the security sector becomes responsible, transparent and accountable to the citizens and their welfare. It is necessary to understand that SSR is not confined within the national boundary in the case of Nepal due to the open and porous border with both neighbors, India and China. The flexible security in Nepal also affects India and China. ). This PBS show will be telecasted on April 7th, dont let them relay false information. Write a …short comment about the truth and also add the unesco links folks. This is a well researched and thoughful contribution to a tough problem in the CPA.